Have you ever been in a home where you immediately sensed which bygone decade the last updates occurred in? Maybe the avocado green kitchen screamed 1970s, or the pastel floral wallpaper made you feel like you stepped right back into the 80s. Whatever the style, it was trendy at the time, but trends seem to fade about as fast as that hot new paint color can dry. Kitchen and bathroom renovations can make a home more functional and enjoyable, bring it up to date, and increase resale potential. 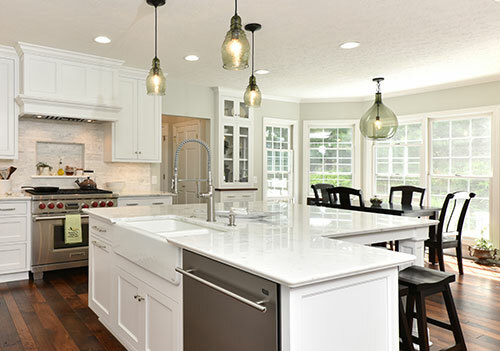 Although revitalizing your home is an exciting process, the decisions that go along with any major renovation can be difficult, since you—or future owners of your home—may be living with these decisions for a long time. Selecting timeless style elements is a good way to continue to enjoy your renovation for years to come. Bold colors bring energy to any room, but when it comes to major items such as cabinets, countertops, backsplash, appliances, flooring, and even plumbing fixtures, sticking with neutral colors has greater potential to create a timeless look. These days, you can find tiles with just about anything on them—flowers, geometric patterns, even birds and animals. And wallpaper has made a comeback in recent years, featuring contemporary patterns and textures. While trendy patterns can look great in moderation, it’s a safe bet to say that they’ll go out of style long before neutral tiles and painted walls. Consider whether you’ll want to live with the pattern five or ten years from now, or whether you’ll be ready to make another update when it goes out of style. If you’re absolutely set on incorporating a trendy pattern into your design, try using it as an accent instead of filling a large space. For example, wallpaper a single accent wall while leaving the other walls in the room painted a neutral color. Or create a border row on a tile backsplash or wall that features a bolder color or pattern than the rest of the tile. If you’re going for a timeless look, choosing neutral colors and patterns for your renovation does not mean your home has to look ho-hum. Think of these neutrals as a perfect backdrop for whatever design style you want to showcase. Adding bold accessories is a perfect way to let your personal style shine. Window treatments, area rugs, and throw pillows can bring color, texture, and warmth to your home. Artwork, dinnerware, pottery, or seasonal decor can show off bold colors or patterns. Even choosing a few accent pieces of furniture can pull a look together and make a room feel more inviting. These accessories are generally much easier to replace than major elements such as flooring, countertops, or tile. If kitchen cabinets or bathroom vanities are part of your home remodel, consider drawer and door styles that work well with your home’s existing style. Raised panel, recessed panel or shaker are timeless favorites that work well in traditional, country, or transitional style homes. Flat-panel cabinets look great in modern style homes. Door and drawer styles can even be mixed for a unique but timeless look. Whether your goal is to create a timeless update, embrace the latest trends, or integrate both, we can help design the perfect solution for your space. Just give us a call!